This Sunday is Grand Old Day on Grand Avenue! St. Paul's largest annual street party fills Grand Avenue with music, vendors, and family fun. Catch the parade at 9:30 and stick around because the events continue all day. For more info visit the Grand Ave website. 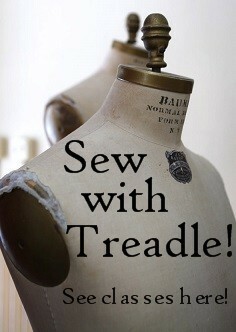 Treadle will be closed during this Sunday's Grand Old Day, so stop by to shop on Saturday instead! We have more fresh new floral prints to share with you! Cotton prints are so beautiful, fun, and versatile! Easy to sew, easy to craft with, easy to wear. Stop by and see our whole selection! We have some fun new Robert Kaufman prints in the store. First up are these featuring glamorous ladies from the City Chic line. Check out the vintage dresses! Next we've got a couple from Kaufman's Mod Geek collection, sure to delight your inner nerd. So what's your style: geek or chic? Or maybe both? New at Treadle: Lennox Gardens by Robert Kaufman. This assortment of bright, bold floral cotton lawn prints is so cheerful and eye-catching, it's hard to resist! The light, drapey hand is prefect for dresses and blouses, and florals are classic for Spring. We have loads of new denim in the store, as well as denim's softer, lighter cousin, chambray. Like denim, chambray gets its subtle color effects from white filling yarns woven into a dyed warp. While denim is firm and sturdy, chambray is soft, drapey, and a little more versatile. Particularly noteworthy are these dotted chambrays! The teeny pindots add just enough interest. Whether you're longing for jeans, dresses, jackets, or blouses, there is a chambray or denim at Treadle just right for your project. We have a beautiful selection of amazing new double-sided fabrics in the store! From airy double gauze and soft, drapey jersey to bright, heavy denim, there is a double-sided fabric for every garment! Why double-sided? Doubling gives a lightweight fabric better drape and opacity, and seeing a peek of the contrasting or coordinating side can liven up a garment. Double-sided fabrics are ideal for unlined garments and designs with turn-back edges like cuffs and cowls. Or try sewing your seams the "wrong" way out for a piping effect! These plaids are a treat for the eyes! Fresh, springy colors and two patterns for the price of one, since these cotton double gauze fabrics have a different pattern on each side. Next we have a group of soft double jersey. The colors contrast boldly, and the fabric drapes fluidly. Perfect for soft, easy-to-wear dresses and tops. We also have double-sided denim! Give denim jackets, pants, and bags an update with an unexpected dash of color. There are even more double-sided fabrics in our store! Stop by Treadle to check 'em out!